Suppliers to energy industries ride a roller coaster. Boom times are big, and bust times are brutal. Theories vary for sticking around and succeeding through these cycles, but Midwestern Manufacturing’s plan seems to be working. The Tulsa, OK, family-run manufacturer of side-boom attachments that convert bulldozers into pipe layers, and builder of other pipeline equipment, has been at it since 1953. 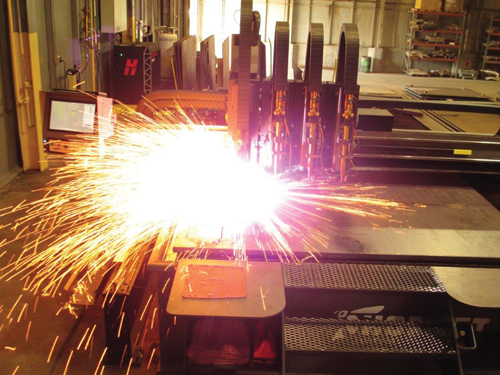 Plasma cutting represents one of Midwestern’s core competencies, as the company uses the technology to cut about 75 percent of the steel it consumes during manufacturing, according to Beffer. As such an important asset for Midwestern, the company must make sure that its plasma-cutting equipment remains reliable and meets customers’ ever-growing requirements. This brings us to another Midwestern longevity strategy. 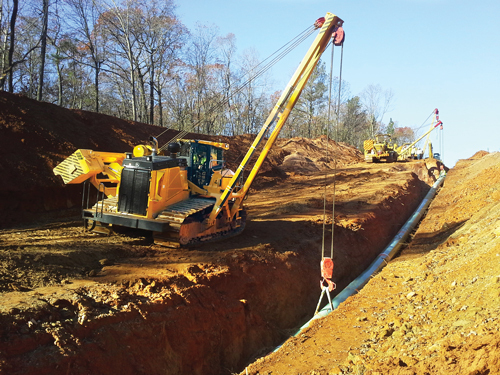 An evolution in pipe-laying equipment brought Midwestern to the point of discussing a major, recent equipment addition. Within the last 10 to 15 yr., according to Beffer, tractors and bulldozers incorporated new designs, with OEMs and customers looking for side-boom attachments incorporated into new tractors or meshing seamlessly with existing equipment. “Changes in emissions standards, among other factors, led contractors to update their tractor fleets, and we’ve had to meet their requirements,” Beffer says. “If you bought your first car, say a cheap old one for $500, you might slap anything on there and not really care what it looks like. But with a new car, you’ll want anything you add to look like it came from the factory. 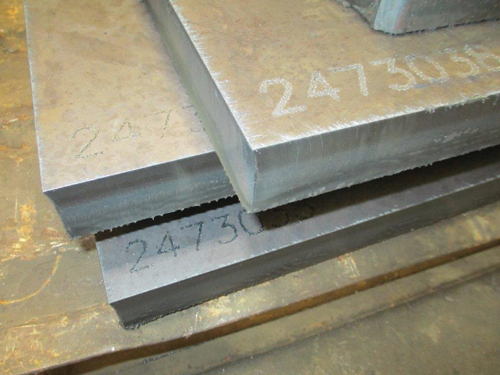 Midwestern Manufacturing’s new plasma-cutting machine deliveres improved hole quality, precisely cuts steel to 2 in. and results in precise part fitup, which enable the company to design and build attachments that mesh seamlessly with newer OEM tractors. Where 20 years ago Midwestern performed about 95 percent of its manufacturing inhouse, today, to meet tighter precision standards, inhouse work accounts for 70 to 75 percent with the rest shipped to suppliers with high-performance equipment. 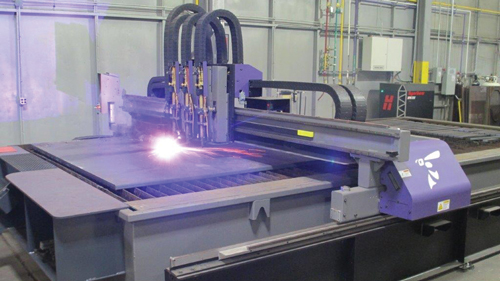 However, because plasma cutting is considered a core competency, Midwestern decided to upgrade its own process capabilities. With its new plasma cutter, Midwestern can mark parts to various depths, with some marks designed to disappear after painting and others to provide legibility in the field. Midwestern, working with its distributor Airgas Midsouth, opted for a Hornet-XD CNC plasma-cutting machine from Hornet Cutting Systems, Valley Center, KS, outfitted with the new XPR300 plasma system from Hypertherm, Inc., Hanover, NH. The new equipment, featuring a 10 by 24-ft. table, went live at Midwestern this past July, with the Hornet Cutting Systems team providing installation and initial training support. The XD’s precision-machined, dual- linear-way beam gantry is engineered to handle rapid acceleration while providing the stiffness necessary to deliver smooth motion and precise cuts, according to Brice Turner, president of Hornet Cutting Systems. The heart of the machine, the XPR300, represents the latest plasma-cutting technology from Hypertherm. As part of the company’s new X-Definition class, the 300-amp. unit features refined high-definition plasma processes to deliver high cut quality on mild steel, stainless steel and aluminum, according to Hypertherm officials. These include patent-pending Vented Water Injection, plasma dampening and vent-to-shield technologies. The end result reportedly includes squarer cut edges and reduced angularity compared to previous models. Piercing capability also is improved on the XPR300 thanks to increased power and an exclusive argon-assist process, which enables 30-percent-thicker piercing on mild steel and a 20-percent increase on stainless steel compared to the equipment it has replaced. Other listed improvements include technology that protects consumables from the negative impact of ramp-down errors, allowing them to last as much as three times longer than on older-generation systems. Other benefits of the new plasma cutter include an easier way to balance speed versus cut quality, according to Beffer. Typically, cut quality suffers as cutting speed increases. The new machine provides more automated amperage settings than the old equipment, allowing operators to quickly and more finely tune speed and cut quality. Hypertherm’s ProNest nesting software is a key contributor in delivering this ease of use. Beffer also notes that the machine provides easier and quicker cutting-head and consumables changeout, leading to a decrease in downtime. A major plus for Midwestern is the new machine’s marking capabilities. “Marking is huge for us,” says Beffer, noting that marking limitations represented a sore point for Midwestern in the past. “When we bought the new machine, we knew that it was going to do what we wanted it to from an etching standpoint. As we cut, we convert the system to mark part numbers to the size we want, and the quality of the lettering is spot-on. The machine etches to an ideal depth so that when painted, the numbers disappear, which is what we want. The newfound ability to burn precise holes via plasma cutting allows Midwestern to cut back on time-consuming secondary drilling. Midwestern also performs centermarking for drilling operations on the new plasma machine. “This capability saves us substantial man-hours in layout and drilling operations,” Beffer says. Though only a couple of months into production, Midwestern has logged numerous examples of efficiency and quality improvements via the new plasma cutter. Included is fabrication of a winch-box base plate, measuring 3-ft. square and made from 1.5-in.-thick mild steel. 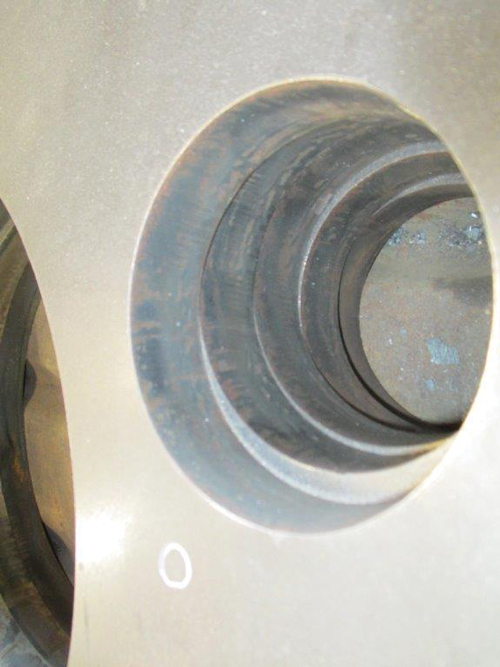 Key here, according to Beffer, is Hypertherm’s True Hole cutting technology, which working in conjuction with Hypertherm’s ProNest and CNC software, reportedly can deliver bolt-hole quality automatically, and virtually eliminates hole taper.